The German Shepherd dog (GSD) originated from breeding long-haired, short-haired, and wire-haired local farm and herding dogs from Bavaria and Wurttemberg, Thuringia. The early German Shepherd was bred to herd sheep and assist farmers. After WWI, the breed name was changed to Alsatian Wolf Dog to distance the dog from anti German sentiments. 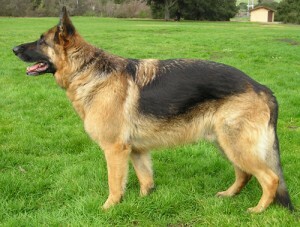 The breed did officially change back to German Shepherd in 1977. Some parts of the world still refer to them as Alsatian dogs. The German Shepherd Dog is intelligent and versatile. They are courageous, intuitive, confident, and eager to learn their jobs. The German Shepherd is often used by police departments because the traits they possess make them favorably suited for public service. The German Shepherd is completely devoted to his owner and family. With proper socialization and understanding of the breed they can interact and get along easily with other pets. They require daily exercise that is rigorous and expends their boundless energy. German Shepherds need mental challenges and thrive on cognitive stimulation and problem solving. Attention to mental stimulation is highly recommended for owners of GSDs. Daily outings or walks would are critical to their health and well being. Proper socialization in addition to basic obedience beginning with puppyhood is important. They can be cautious with strangers and they will likely bark assertively if they sense danger. The German Shepherd’s history as a farm dog disposes them to be very protective of their territory or yard. They are guardians by nature and this may cause them to behave in a confrontational manner. It is wise to exercise extreme caution when approaching or visiting homes with a German Shepherd. They have been known to act aggressively in order to protect. Because they are so often used for police work, some lines of GSDs have developed behavior that makes them unsuitable as household pets. Police lines often suffer an ADHD-like excitability and lack of impulse control. Some have developed what looks like ‘impulsive aggression’ – sudden, unprovoked, disproportionately savage attacks on another dog or on a human. If you are considering a German Shepherd Dog as a household companion, it is important to be sure you choose a dog from a working guide dog line or a companion dog line, and avoid breeders who supply police trainers and/or shutzhund clubs. This is particularly important if you expect the dog to interact safely with children and with other animals. The German Shepherd Dog is a large canine, weighing between 75-90 pounds when full grown. The GSD’s coat needs brushing daily and will shed usually twice a year. Hereditary diseases to be aware of include elbow dysplasia, blood disorders, digestive problems, chronic eczema, keratitis (inflammation of the cornea), and skin allergies. Show lines can have hip dysplasia so serious that it cripples the dog at a young age. The GSD has a life expectancy of approximately 13 years. In North America, from 1982-2015, German Shepherds have been responsible for 123 attacks on humans, resulting in 81 maimings and 15 fatalities. German Shepherd mixes have been responsible for 70 attacks, resulting in 41 maimings and 11 fatalities. I have absolutely no idea why this article makes comments about crippling hip dysplasia in show lines. There is some hip dysplasia in all bloodlines of German shepherds. German Shepherds are judged in the show ring almost exclusively by topline and side gait. The dogs with severe hip dysplasia are usually restricted in movement. Thus, they will not win. Show breeders are among the people who do the most hip screening by X-rays. I breed and have some show bloodlines. Pedigrees of these dogs will show a lot of hip certification. Too many backyard breeders know nothing about quality, soundness, and temperament. It is best to buy from breeders who know about the breed and care about the welfare of the breed. You’re the first to notice. It’s been bugging me for 3 years but I just couldn’t justify spending hours finding all pages and comments that link to the breed description and redirect to the new URL. I’d much rather spend my time updating the DBRF’s and spreading awareness in an attempt to prevent what happened to our family from happening to someone else’s. – Jeff B.
PS: How’s the weather down in Arkansas this time of year? 113 attacks in 32 years out of an estimated 4.5 million GSD in US and this is considered a dangerous dog? Bill Atnip, I agree. This is a ridiculous, alarmist website. Regarding the statistics on German shepherds, do these numbers include police dogs? Just inquiring as my dog is a GSD/Lab mix. The numbers do include police dogs.